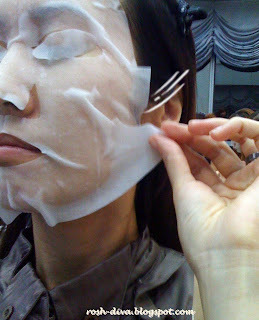 I attended a special Aqualabel workshop at Shiseido's beauty studio. Sunkisstiffy was the first to reach and so we chatted a bit. She's keen to check out the moisturising range and me on the whitening range, so we sat opposite each other. even before the trainer came. The last time we meet was at a Nuffnang event. Yanny Li (the trainer) came and the workshop commenced. 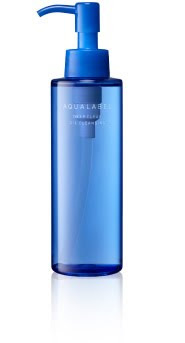 We were all told to remove our makeup and try the entire range of AquaLabel products. There were many things that were taught but it's too detailed to go through everything in this entry. So I will just explain in summary some of the key lessons I've learnt, before you fall asleep on me. The exclusive AQUALABEL technology deeply infuses and locks in high amounts of moisture in skin by the 3 main actions; which is to SINK, SATURATE and SEAL. Sinking the ingredients into your skin with Aqual Synergy and Saturate and Seal them with moist aqua keeping base. I'm only going to touch on the whitening range (which is my specialty!) 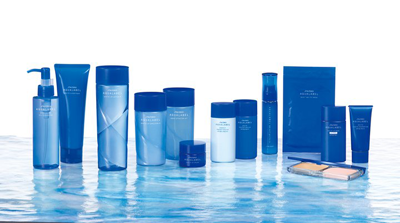 This whitening range in blue bottles and packaging focuses on repairing and preventing problems such as pigmentation and brightening skin's overall clarity. The cleansing oil is comparable to Fancl's cleansing oil. The texture a little milder and the price is cheaper than Fancl's. 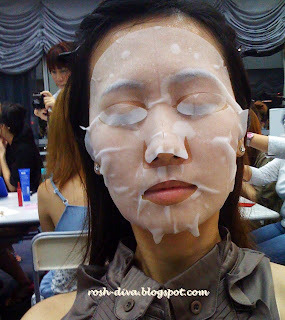 It removes makeup just as well and it contains a mild rose scent, which is therapeutic. We were given a damp, hot towel to wipe our faces. The enhancer is to be used just before the sunblock, after the entire skincare regime, meaning after your toner/softener, emulsion, essence and moisturiser. It LOCKS up all the ingredients deeply into your skin so that the moisture is maximally absorbed. The texture of the enhancer is just like a toner. It has the the lid for eyes too. Finally, I'm with a happy and clean face. 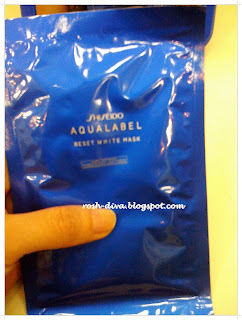 AquaLabel gave us travel size pack and one reset white mask to bring home. Hi Citrella, I love your callsign. Reminds me of....ha ha, you know. Anyway, reading your this posting of Shiseido reminded me of one time my wife requested my getting her a product from this company....I was in Tokyo. And I got lost in the huge mall while searching for it. And nobody spoke English....used sign language like practicing Tai Chi. Anyway, nice blog you have....and you looking good. @Ju Ann - hehee yup, specially love the samples to take away. @Uncle Lee - Thanks. Interesting blog you have. I am going to read later.